The DeBaliviere Place Neighborhood is just north of Forest Park. Its boundaries are Lindell Boulevard along Forest Park on the south, Union Boulevard on the east, DeBaliviere Avenue on the west and Delmar Boulevard on the north. Surrounding neighborhoods are the Central West End Neighborhood to the east, Visitation Park and West End neighborhoods to the north and the Skinker DeBaliviere Neighborhood to the west. The DeBaliviere Place Neighborhood has the advantage of being located immediately north of a St. Louis "gem," Forest Park. DeBaliviere Avenue is one of several entrances to Forest Park and to one of the many amenities of the park, the Missouri History Museum. Golfers will enjoy that the Forest Park Golf Course, also known as Forest Park Golf Course-Norman K. Probstein Golf Course, a public golf course with three 9-hole golf courses, is also located in Forest Park. The walking, jogging, skating, biking or "whatever you would like to do" trail, that runs around and through the entire park, is accessible along Lindell Blvd. The residents of DeBaliviere Place also have another advantage, access to the MetroLink light rail service at the Forest Park-DeBaliviere MetroLink Station located on DeBaliviere Avenue. This station gives access to both the Red and Blue Lines of Metrolink. The residents of the neighborhood are served by the St. Louis Public School District. While there are no district schools within the neighborhood, there are some nearby. Two are located in the Skinker-DeBaliviere Neighborhood, the Saint Louis Medical High School, a Magnet School with a specialty or focus of "Pre-College Curricula" on Des Peres Avenue and the Hamilton eMints Elementary School on Westminster Place. And one is in the Hamilton Heights Neighborhood, the Ford Elementary School on Clara Avenue and the There is a private school located within the neighborhood. The private school is the St. Roch School which is a Catholic school with classes for students from Preschool to 8th grade. Conveniently located in the Academy Neighborhood on Union Boulevard, is a branch of the St. Louis Public Library, the Cabanne Branch. The Cabanne Branch is one of the six libraries built with the orginal gift from Andrew Carnegie with stipulation that the libraries would be "free to the public." In 1776, this land was part of a Spanish Land Grant given to Madame Marie Louise Papin and when surveyed in the early 1800s, contained 2720 acres. By the middle of the 1800s, Madame Papin's land, as well as most of the historic Central West End neighborhood, was owned by men whose names can be found on many of the surrounding neighborhood streets today. Those land owners included Peter Lindell, William McPherson, Pierre Chouteau, Jr, Jules DeMun, William Forsyth, John C. Cabanne, and Thomas K. Skinker. Most of the land west of Kingshighway remained rural in nature with large estates and farms. It was the anticipation of the 1904 World's Fair that contributed greatly to the further subdividing and urbanizing of the land north of Forest Park and as far west as DeBaliviere Avenue, which was the main entrance to the Fair. Julius Pitzman, an important St. Louis surveyor, laid out Kingsbury Place and Washington Terrace in 1902 which were private streets that featured many of large homes that are still found there today. The "Gates" to these private streets are beautiful architectural prologues to what can be found within! The Debaliviere Place Neighborhood has its share of City Landmarks. One of them is the Westminster Presbyterian Church. 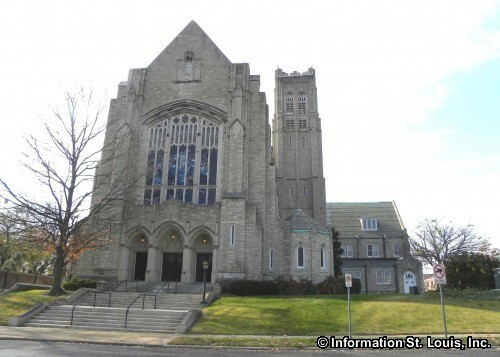 It is located on Delmar Blvd at Union and was built between 1913 and 1915 for a congregation that was displaced when the Fox Theatre was built on Grand Ave. Several of the stained glass memorial windows from the old church were saved and used in the construction of the one at Delmar. Two other landmarks in the neighborhood are private "gated" streets, Kingsbury Place and Washington Terrace. Both streets were fronted with regal entrance gates, meant to lure purchasers to the lots within with visions of promised granduer.